"For Sliding Doors - 750 lbs. Holding Force"
- Delivery: The RCI 8360 Mortise MiniMag is factory-ordered, please allow 3-5 working days' lead time. Our low-profile 8360 mortise MiniMag® is specifically designed to provide a secure hold (up to 750 lbs. holding force) on sliding doors. Applications: Perimeter and interior sliding doors. Small enclosures. Used for Cash Drawers, Vending Machines, Filing Cabinets, Access Cover Hatches, Industrial, Commercial, Residential, Health Care & Retail. - Hardened steel armature nut. - Built-in remote lock status (RLS). - Brushed Anodized Aluminum finish (US28). 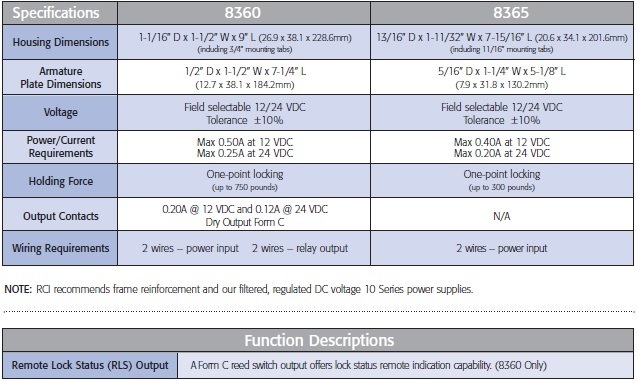 Remote Lock Status (RLS) Output: A Form C reed switch output offers lock status remote indication capability.